PRODUCT: Fixed Wall-Mount Roof Access Ladder. For Roof Hatch / Roof Access. 1500 lb. Capacity. Heavy Duty All Aluminum Construction. Available 10-20 Foot Options. Price/Each. * Special order, 2-3 week leadtime, not-returnable. Meets or exceeds OSHA, ANSI 3123 and A14.3 standards. Manufactured from non-spark, high-strength materials to applicable ASTM standards, with standard mill finish. 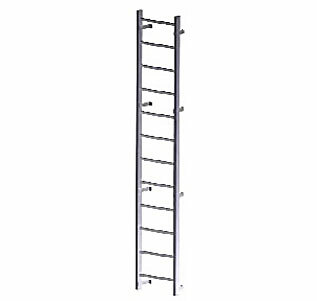 Ladder rungs are 18” wide with 1-1/4" deep steps and made from serrated extruded aluminum for sure-footed climbing. Rungs feature 1,500 pound load capacity. Designed to install with the top just below a hatch door to assure a safe entry and exit. Optional: Added wall mount bracket at the bottom, to mount ladder off the floor. Suitable for hatch access heights of 20 feet or less.